Bound into a volume containing manuscripts owned by the 16th-century collector, Robert Cotton, this is a page of a treatise on military arts, arms and heraldry by Nicolas Upton, a canon at Salisbury (became precentor 1446) and Wells cathedrals and the foremost English authority on heraldry in his day. It is uncertain where the manuscript was made. 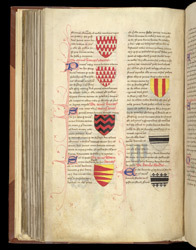 In Upton's reference work on heraldry, this page gives terminology for and illustrates different kinds of bars and band patterns used in arms.